Yes, the demolition continues and we’re uncovering more and more (expensive) surprises. 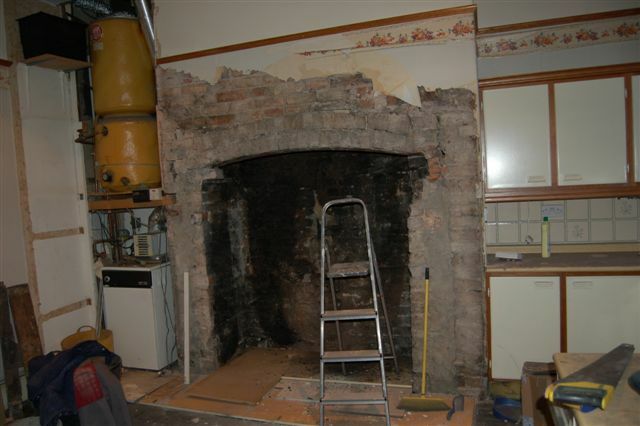 We have managed to open up the chimney breast, but it seems the whole things is precariously being held up by a few wonky bricks! Today or Monday the supports should arrive so they can prop it up and continue to open up the right hand side (which is wider). The entire cavity was filled with a mixture of soot and rubbish which had to be removed bucketful by bucketful. Our entire house is covered with a layer of black soot/dust. It is at it’s worst in the kitchen, as you can see above, but I have been told not to clean up, because there is more dirt to come. Problem is just, this dust spreads to the rest of the house, and it is on everything. I just wish I could wash the (white) floors, but they will get so dirty immediately afterwards, because this layer exists on the floor too. Each time you walk from the kitchen to the the rest of the house, you carry this filth with you. We were told yesterday that due to all the nasty surprises (and due to me adding things onto the project as I have been let down by so many of my other tradesmen), the kitchen will now have to be moved back … to 30th April 2007!!! That is 6 weeks away and 2 more weeks for installation, so we’re talking mid-May by the time we’re done. We had planned to move the install to mid-April, but the kitchen company couldn’t accommodate that. 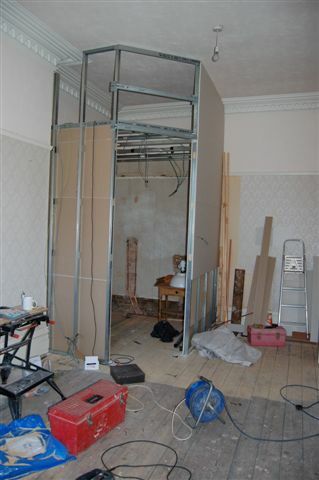 This is what our en suite bathroom looks like at the moment. Today they should be working on some of the walls, because our built-in-cupboards will be installed to the left of the bathroom tomorrow. We got a man out who specialises in cornicing. On the phone he told me that the costs would be: £250/£300 for the mould, £50 per 3 metre length and £200 to fit (although my builders could do it. When he arrived, the first words from his mouth were: you’re not in Altrincham, you’re in Bowdon. Yes, I said Bowdon, Altrincham. (It is like saying, you said you were in Pretoria, but you’re in Waterkloof, when you’re in Waterkloof, Pretoria). After a few arguments, we realised that we’re falling victim to ‘Bowdon pricing’ again. That price he quoted me on the phone was a price for work in a house in Altrincham. Because we were Bowdon, this cornice would cost us £1500!! I nearly fell on the floor. I have him the opportunity to honour his first price on the phone, but this was just ‘too complicated’ and all of the sudden the rubber they make their moulds from was just ‘so expensive’. I told him that at £1500 we wouldn’t consider doing it, and with, he literally threw his business card at me, saying: ” I came, I saw, here is my card”, and left. But I think if he didn’t go of his own accord, Tim was going to kick him out!